Kothu Parotta: Kothu Parotta (literally, minced parotta) is a delicacy popular in the South Indian state of Tamil Nadu. It is based on a Sri Lankan version where it originated as Kothu Roti. It is made using parotta, egg, meat, and salna, a spicy sauce. The ingredients are thrown on a hot cast-iron griddle lubricated with oil. These are minced and mixed by repeated pounding using a heavy iron spatula, the sound of which can be heard for a long distance. It is served with onion raita. Heat the oil in a wide pan, on medium flame. Add in the mustard seeds, cumin seeds and curry leaves. Add in the finely chopped onions. Add in the garlic – ginger paste and green chillies. Add in the cubed red bell pepper. Sauté the mixture, for few seconds. Cook, stirring occasionally until oil separates. Add chaat masala powder, red chilli flakes, garam masala powder and salt. Add in the chopped parotta. Stir fry the parotta pieces, until the parotta pieces are well coated in curry and onion mixture. Break the eggs and add into the pan directly. Increase the heat to high and mix continuously until the eggs are scrambled. Now bring the flame to medium-low, and cook the eggs, until the masala turns dry. Kothu parotta is ready to be served. Serve hot kothu parotta with onion raitha. 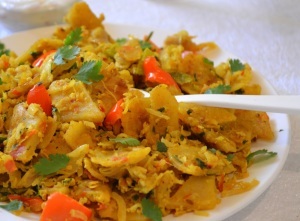 If you have any queries regarding the Kothu Parotta recipe, please leave a comment.